This is the twenty-fourth in a series of guests posts that feature Archtober Building of the Day tours! 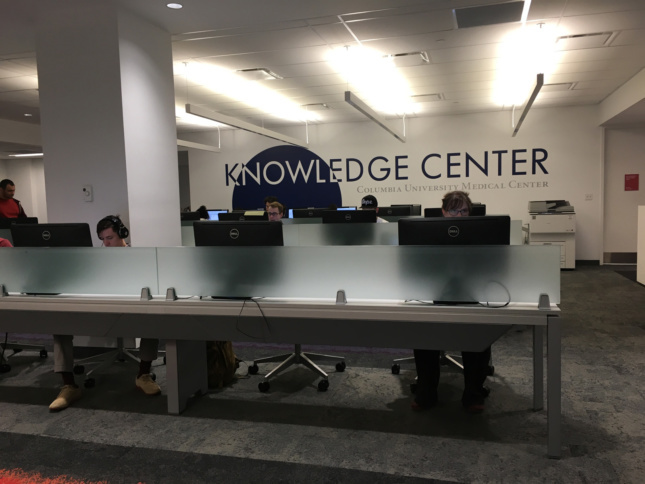 Columbia University came to Mitchell | Giurgola for the renovation of their Knowledge Center after the New York-based firm previously renovated their Learning and Teaching Center in 2008. 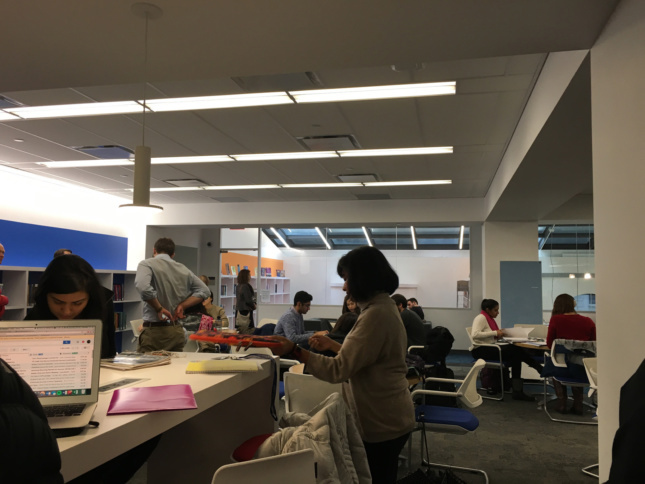 Originally housing the Columbia University Medical Center’s library, Jill Wendorff and Carl Gruswitz wanted to take the space in a different direction as compared to the classic definition of a “library.” Recognizing that a university’s collections consist of more than just books, Wendorff and Gruswitz rebranded the area as the Knowledge Center, a place where tech and data outlets abound. To that effect, Mitchell | Giurgola moved the majority of books offsite and opened up the area to make it much more collaborative. Wendorff wanted to create an open area while having different zones with different purposes. Different furniture items and carpet patterns help designate these different zones. In the spirit of creating a 21st-century study space, Wendorff wanted to add as many power outlets as possible. When it became clear that it wasn’t possible to add hundreds of new outlets on the floor, which would make it structurally unstable, Wendorff worked with Steelcase to create furniture with outlets built into them, thereby distributing the power outlets throughout the room without having to add power outlets to the floor. 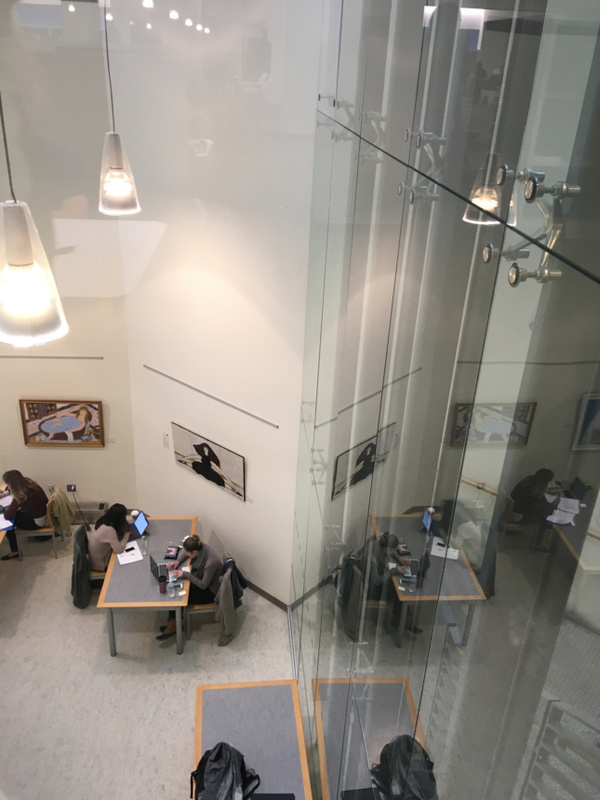 Wendorff wanted the space to be as flexible as possible, so she added movable whiteboards throughout the Knowledge Center; these added study tools and help block off sections of the space. 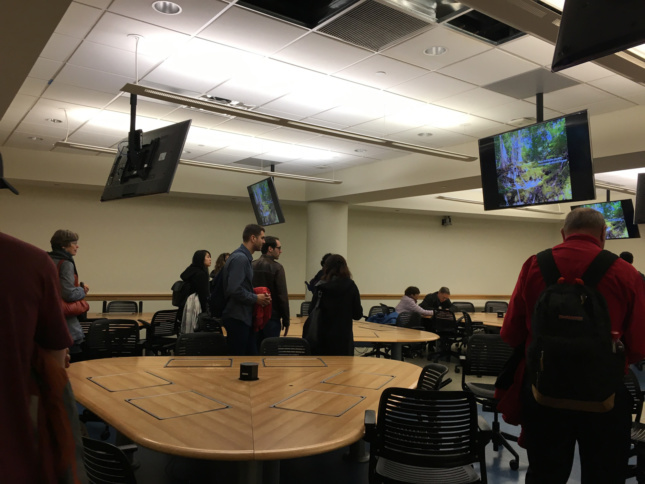 While the majority of the space is very open, there are rooms around the perimeter that students and educators to use as classrooms, conferences rooms, or just to have a quiet work room. In creating the new conferences rooms, Mitchell | Guirgola pulled back portions of the wall to create a new corridor space, connecting the first floor Knowledge Center with the Teaching and Learning Centers on the lower levels. 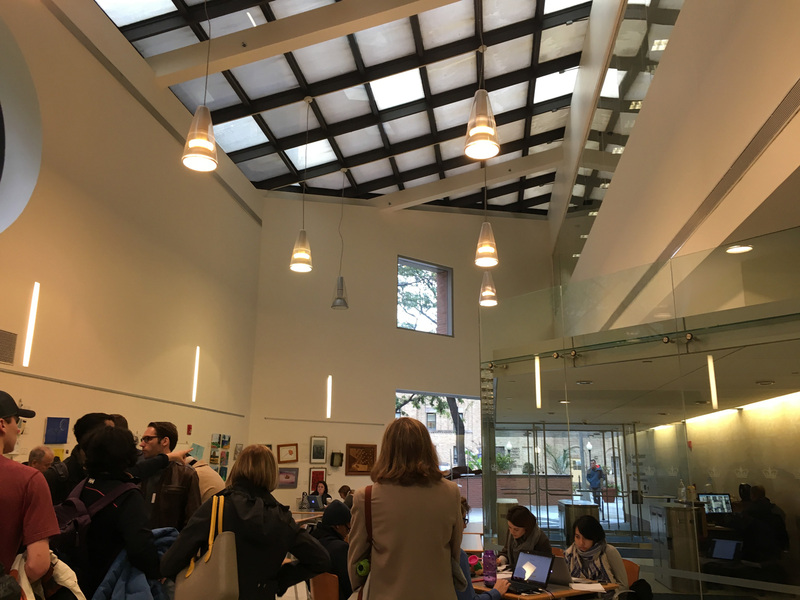 Mitchell | Giurgola renovated the lower levels in 2008, which at the time contained the Medical School’s library. Gruswitz wanted to shrink the collection as much as possible to add new classrooms and learning spaces. Much of the collection was moved offsite, while other materials were digitized as much as possible. For the materials that had to remain on site, Gruswitz employed the use of compact shelving to further compress the collection as much as possible. A total of seventeen classrooms were added to the lower levels of differing sizes. Much like the Knowledge Center on the first floor, the classrooms are able to be divided into different sizes, depending on need. Movable walls allow the larger classrooms to transform into two smaller classrooms, adding much needed space when needed. The classrooms follow the very collaborative method of learning featured throughout the site. They have large tables with computer connections that allow students to share images with other students also connected at the table. Additionally, large TV screens allow them to display the images for the entire class when needed. The classrooms extend out into the sidewalk, and as Gruswitz told us, the space originally had a large supporting column through the middle. This column had to be removed to accommodate the classroom, so Mitchell | Giurgola instead installed a large horizontal girder through the ceiling for structural support. 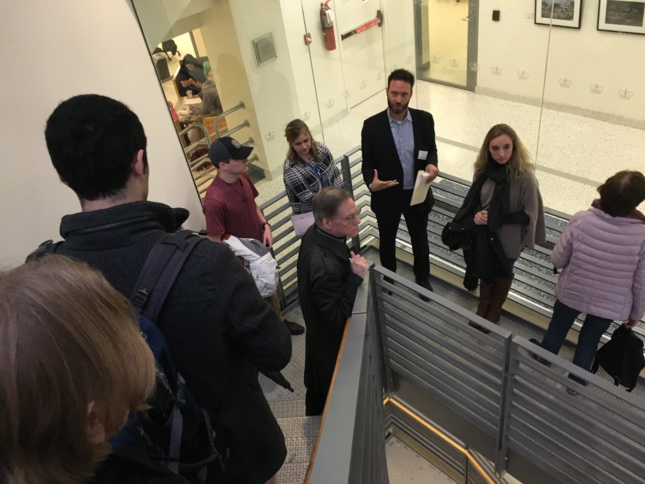 We ended our tour in the student lounge, which had large windows installed during the 2008 renovation. This allows those in the Knowledge Center to peer down to the lounge. The added glass also helps to bring light into the subterranean space. During the renovation, a new entrance was installed by cutting a doorway in the façade. 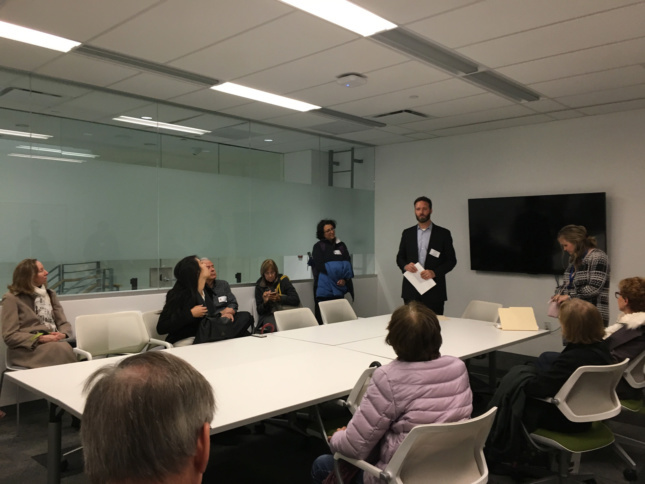 All in all, the renovation of the space helps to create a totally new collaborative environment for the entire Columbia Medical Center. Join us tomorrow as we venture to Hudson Yards! About the author: Jacob Fredi is the Public Programs and Exhibitions Coordinator at the Center for Architecture. When he’s not on Building of the Day tours, you can find him playing board games (Shadows Over Camelot!) and brewing his own beer.